Keira Knightley stars in the wild action thriller "Domino," the latest project from director Tony Scott ("Man on Fire," "Beverly Hills Cop II," "True Romance"). 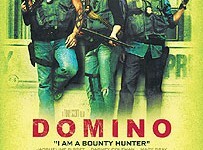 A trademark Scott film, "Domino" presents an entertaining mix of gritty action, biting comedy and sharp visuals. The film tells the true story of Domino Harvey, daughter of legendary actor Laurence Harvey and a former Ford model who rejected her privileged Beverly Hills life to become a bounty hunter. Plus X-Men 2.5 DVD on the way?